Our Apryl is a 5 year old Parson Jack Russell with loads of character and she definately rules the roost. She has many friends including a malamute husky, Jack Russell, Yorkshire Terrier and cats too!! She gives us so much joy, she can talk too in her own unique JRT language. 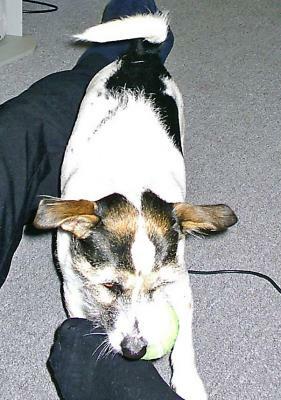 We have always had JRT in our families and will continue to do so i'm sure. JRT get bad reactions when out walking as they're always labelled as snappy terriers but people obviously don't know the breed or they would know what loving, loyal little dogs they really are. She isn't just our dog, she's part of the family.